Since the click is always paired with a food reward, we call this training positive reinforcement. There is no need to punish the dog for offering the wrong behavior, be patient and quickly mark the right behavior when it is offered. Begin with clicker and treats in one hand, and your dog near by. Start by clicking and tossing a treat to your dog, repeat a few times. Next, wait a few seconds to see if your dog will offer a sit. When his bum hits the floor, click and toss him a treat several feet away. Repeat by waiting for your dog to sit again, click and toss a treat. Repeat this several times. If your dog does not know how to sit, put a treat to his nose and raise it up over his head slowly. When his bum hits the ground, click and let him eat the treat. Repeat until your dog begins to offer a sit for the reward. Next, add the verbal cue “Sit” or a hand signal just before the behavior is performed, click for the correct behavior and reward. Repeat with cue added, click the correct behavior and reward. The sound is the same every time; and is unique to other sounds the dog hears. The clicker is the fastest way to accurately mark behavior. (I used it to teach my dog to sneeze, lick his lips and touch the Staples Easy Button). The clicker is the fastest way to capture new behaviors your dog does. It aids in keeping your dog in his thinking brain. Will you always have to use the clicker? Sept. 2007 Chester, my 8 wk old foster. Do you wish your dog looked at you more? I could show you thousands of photos of me with dogs and the dog is always looking at me. Why? How is this possible? Can you feel the connection in this photo? This was the day before I let Chester go to his forever family, I wanted him to know he could trust people and they would keep him safe. My secret? I am good at mirroring a dogs awareness, at reinforcing small behaviors I like. Tip: I never look at a dog and say “no!” as this makes the dog want to leave me. I have good timing, I reward quickly, and am generous with rewards. I avoid letting the dog get frustrated because I reward small attempts from the dog toward the ultimate goal. This keeps the dog engaged and wanting to work with me. Tip: When a dog is aware of me, I let him know I am aware of him also, the connection begins here. Pablo reorients to me with dogs in the distance. I created a video of me training clients dogs, so you can have all my secrets! I am sharing these because I want you and your dog to have a better connection like I do with my own dog, Pablo. achieve specific goals in the comfort of your home. Click here to view the Drop the Leash Promo! Order Your Digital Copy of Drop the Leash Here! “Unbelievable! I learned so much and my dog is coming when I call him!”– Peter C.
“Excellent doesn’t even begin to describe Judy as a trainer! She’s helped tremendously with my reactive and nervous border collie mix Annie. She’s gone from a nervous wreck of a puppy to a cool and collective adult who can now interact with other dogs politely” – Olivia R.
“Unique and easy to follow along, I highly recommend this online class for families, reactive dog owners and anyone who wants to teach their dog to relax in more situations. – Sue B. Tip #1 To change your dogs unwanted habit, you need to know what your dog loves! Once you know the reward your dog is willing to work for, you are ready to change his habit. The same reward may not work for all dogs. Food. I mean high value, like chicken, hotdogs and cheese. Play, such as fetch or tug. In Judy’s puppy class, all pups sit and wait calmly before they get to “go play”. grass can be highly motivating. Sniffing. If your dog is an olfactory machine, use it to motivate. Verbal praise is rarely enough motivation to change a dogs habit. Tip #2 To change your dogs unwanted habit, you need to add a marker, like a clicker or a “yes”, so your dog knows which behavior is rewardable. Catch your dog doing the right behavior or something close to the desired behavior, click or say “yes” the second your dog does the desired behavior. Reward with something your dog loves. 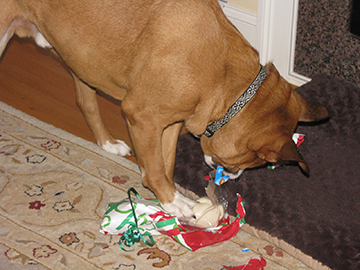 Tip #3 To change your dogs unwanted habit, you need to offer the reward in a timely manner. If your dog sits, rather than jumps on you, you mark the behavior and offer the reward quickly. Well timed rewards helps the dog learn that his behavior predicts his favorite reward, hence he will perform the desired behavior more often. Pablo sits, I click and reward. with what your dog loves, but always reward with something pleasant to your dog. Positive reinforcement works for dogs of all ages, and is a great way to help your dog change his habits. Remember, though, that no one is always right. We all keep learning things all the time, revising and adding to what we knew before. That’s one of the joys of science and a valuable phenomenon in the clicker training world. Looking back at the jackpot section in Don’t Shoot the Dog, now, twenty years after it was written and six years after the revision supervised by Murray Newman, I think that I failed to differentiate between jackpots as I see them, and another tool altogether: the non-contingent reward. A non-contingent reward is also something you get by surprise, but it is not associated with any particular behavior. One example in the book was the two free fish we gave to a discouraged dolphin, which perked her up and set her to trying to earn reinforcement again. Another example in the book was the ticket for ten free riding lessons that my parents bought me when, at sixteen, I was behaving poorly for weeks on end. It instantly corrected my bad mood. I included these as jackpots, but they were not; they were both examples of a non-contingent reward. The most powerful use of a non-contingent reward is to counteract the effects of an extinction curve; I know the dolphin in question was undergoing extinction of a bunch of operant behaviors; probably this sulky teenager was, too. Getting the news that good things are still available revived the efforts to seek reinforcement again. Like the jackpot, a non-contingent reward is a tool to use rarely. And, like a jackpot, if it is going to work, you only need to do it once. Why is my dog so aggressive to other dogs? This can usually be diagnosed with a detailed history: no play ever, hereditary, mother was sick or a guarder, or over socialized with aggressive or rough playing dogs. 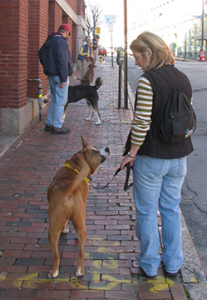 Cycle of On-Leash Aggression (created problem from humans), as described in the Culture Clash, by Jean Donaldson, “The Bully dog” is often kept away from other dogs for long periods of time, he is usually rude with crude behavior brought on by a super motivated greeting as a result of deprivation when meeting other dogs, and has poor social skills. The owner is alarmed by intensity and tightens the leash and get’s too excited or nervous when interactions occur. High arousal, lack of social skills, scuffles with defensive dogs can occur. Barrier frustration such as windows, fences and leashes can increase the dogs frustration which makes you want to “correct” the behavior, which = punishment which = more Aggression = total isolation. I believe dogs need time to express their intentions before they greet unknown dogs. Personalities among dogs differ as much as a classroom full of kindergarteners, therefore, expecting your dog to like every dog they meet is not that simple. Some dogs are very soft and have appropriate greetings, these are the dogs who are able to visit the beach and off leash parks without incident. Helping your dog greet new dogs much slower will give your dog important and necessary information about the other dogs intentions. 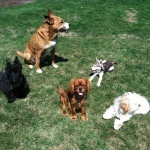 To the left, you see the brown dog in the middle of this pack at a local park. He is standing quite still with head lowered, visible tension in his jaw, mouth closed, low tail, ears back and a his hair beginning to stand up on his back. He is very uncomfortable about being so close to a strange dog and was called away quickly to avoid any conflict. This particular dog’s behavior tells us humans that he needs a much slower greeting with new dogs. In this photo to the left , this beautiful girl has just seen a new dog and is reading the other dogs intentions and clearly expressing hers as well. Note the open mouth and soft eyes, lowered tail which is in motion and she is beginning to offer a play bow. While she is expressing intentions that she does want to greet the new dog, she is very excited and the other dog is a bit alarmed by her intense need to visit. After about 30 minutes of walking near each other, this girl and the other dog became play mates as you will see in the video below. If you have a new puppy, please keep him/her safe and find nice friendly dogs to socialize with. Your dogs friends will influence his/her behavior! Just like you were influenced by those you visited with as an adolescent. So, know who your dogs friends are and watch for signs of fair play between the two and you let’s try to prevent aggression from spreading. Seminar: Adolescent Arousal Turning Your Dog On and Off – Without a Leash!